This zesty frosty is the perfect refreshing treat after a hot day like today! Enjoy. Energizing, sweet, tangy, and lightly spicy. PERFECTION! 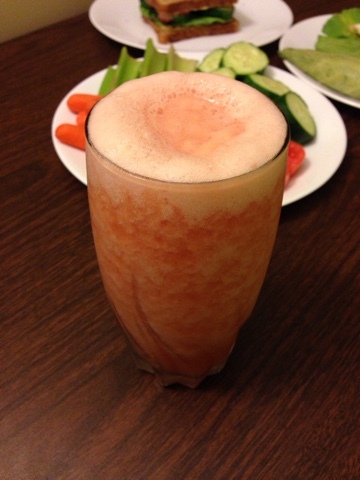 Ginger Grapefuit Frosty. Vegan, Gluten-free. Serves one. 1. Place frozen grapefruit sections in a strainer and briefly rinse under warm water. Place in vitamix with all ingredients and blend low to high until frothy and smooth (add water as needed). Enjoy! 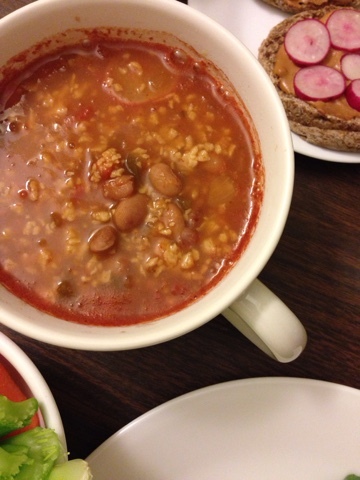 Radish Chili. Vegan, Gluten-free. Serves one. 1. Mix tvp with spices, water, and a dash of braggs liquid aminos. Microwave 1 1/2 minutes. 2. Combine all ingredients in a small soup pot and bring to a boil. Reduce, simmer 10, and serve. Enjoy! 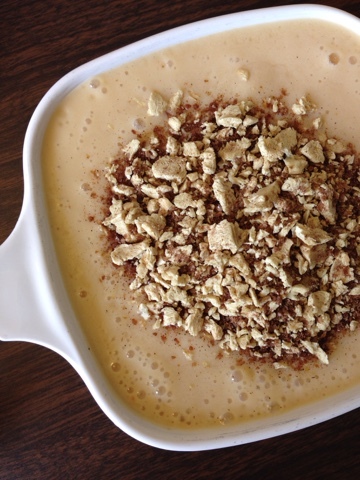 Peach Cobbler Smoothie with Cinnamon Crumble gRAWnola. The whole package. YUM ALERT Y'ALL! Peach Cobbler Smoothie with Cinnamon Crumble gRAWnola. Vegan, Gluten-free. Serves one. 1. 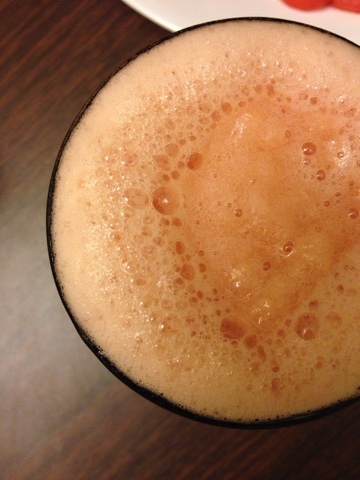 In your vitamix, blend peaches, tofu, and milk of choice. Pour into large bowl. 2. 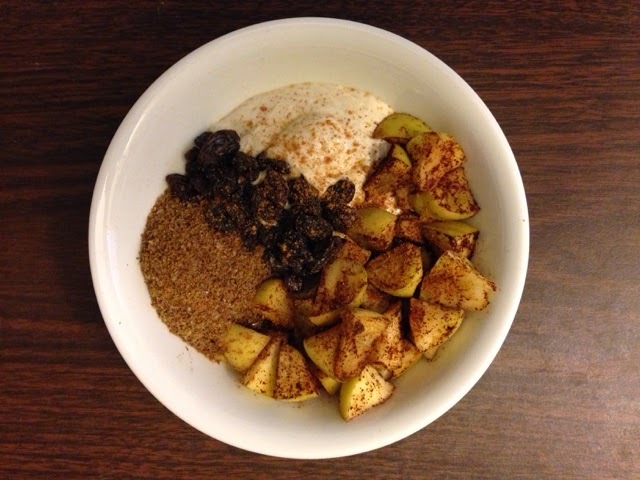 Mix tvp, flax, cinnamon, and stevia in a medium size bowl. 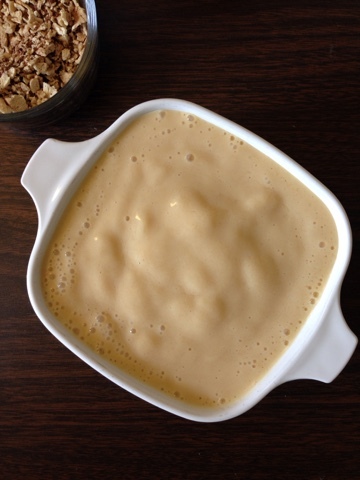 Top smoothie with gRAWnola crumble and serve immediately. Enjoy! Yeah, I went there. No words. Except BOMBALICIOUS DELICIOUS! Enjoy! Everything can be used as an oatmeal topper! SO GOOD! 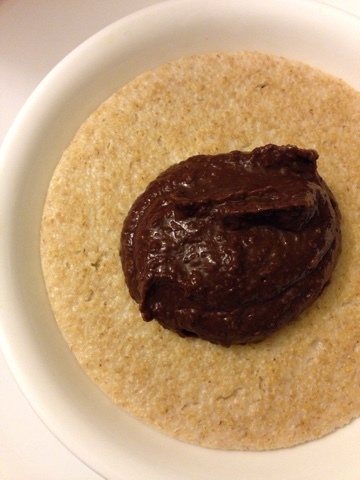 Brownie Batter Hummus Dip! Vegan, Gluten-free. Serves one. 1. Blend it, yo. And then eat, of course! Use as desired-it's delish on oats, in a sweet Sammie, or even with veg. Yum! 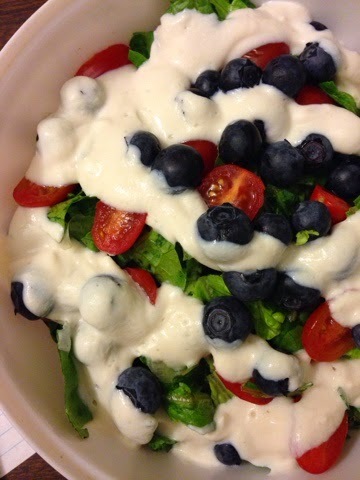 Red, White, and Blueberry Salad. 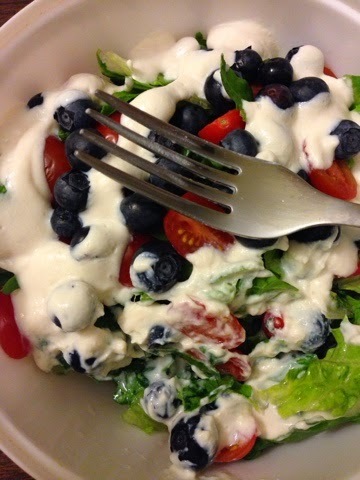 Red, White, and Blueberry Salad. Vegan, Gluten-free. Serves one. 1. The dance goes like this: lettuce, toms and bloobs, Nogurt, eat. YUM. Holiday post! 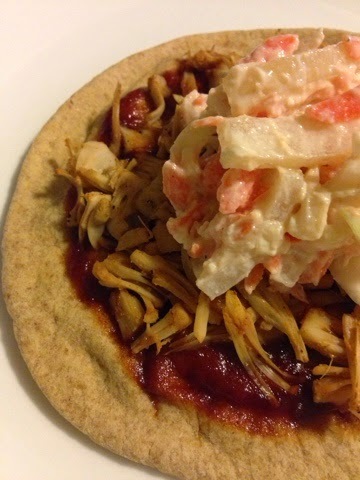 : Memorial Day BBQ Pulled Porkless Pizza with Vegan Coleslaw! Memorial Day BBQ Pulled Porkless Pizza. 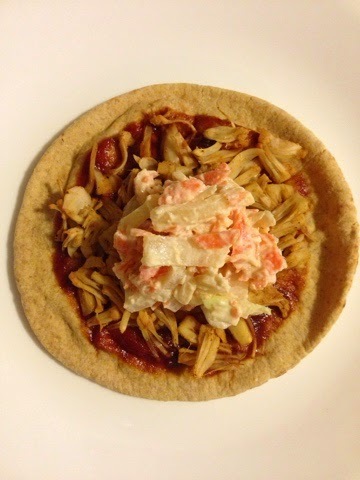 Memorial Day BBQ Pulled Porkless Pizzas with Vegan Coleslaw. Vegan, Gluten-free option. Serves one. 1. Don't let he long ingredient list scare you off--these little fellas are SOOOO simple. Place Pitas on a baking sheet and spread 1 T BBQ sauce on each. Set aside. 2. Preheat oven to 350. Heat a nonstick skillet over medium heat. "Shred" jackfruit by forcing a form through each piece. You will end up with "shreds" that resemble shredded chicken, or in this case, pork! 3. Place jackfruit shreds in skillet with aminos, splash of water, and all spices. Cook about 5 minutes, till slightly browned (should look like pork). Divide among pizzas and spread evenly. 4. Place in oven and bake uncovered for 8 minutes. 5. While pizzas are browning, combine all veggies for slaw in a medium size bowl. In your food processor, combine tofu, vinegar, Dijon, spices (minus pepper), and aminos. Blend until smooth and add to slaw veggie bowl. Add pepper and mix well. 6. Once cooled, place slaw on top of pizzas and serve. Everything Stew. Vegan, Gluten-free. Serves one. 5. Spice blend: 1/4 tsp EACH of onion powder, garlic powd, fenugreek, and turmeric, plus PINCHES of pepper, paprika, and cumin. 1. 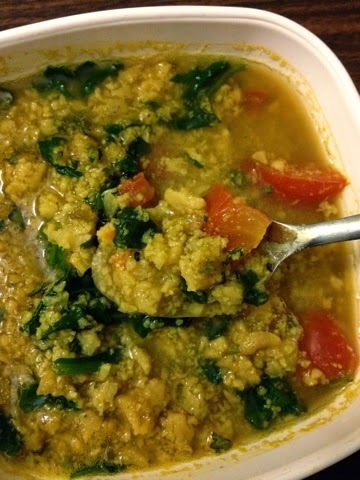 In a small soup pot, combine water, spice blend, and aminos. 2. Mix tvp granules with more of the same spices listed for the spice blend (plus some aminos) and 1/2 c water. Nuke 1:30. Add to pot with chopped tomatoes. 3. Bring to a boil, reduce, simmer 5 minutes, and stir in chopped spinach. Serve garnished with parley. Enjoy! Guilt-free apple pie for brekkie? Yes. Apple Pie Breakfast Bowl. Vegan, gluten-free. Serves one. 1. 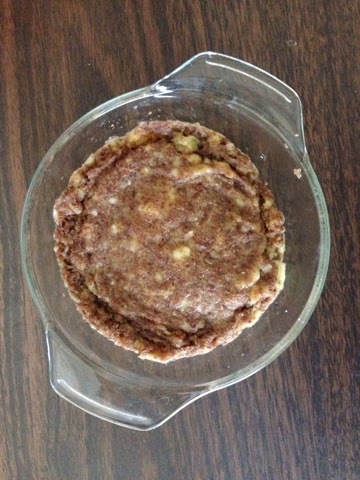 In a medium size microwave safe bowl, mix you Apple chunks, liquid stevia, and cinnamon. Nuke one minute. 2. 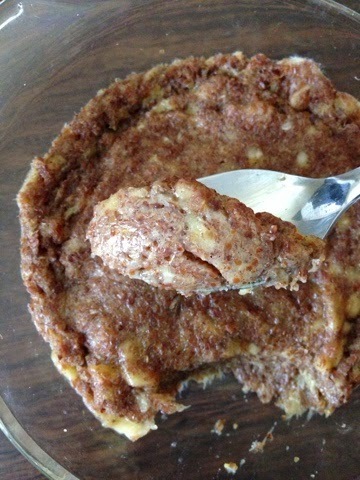 In your mini food processor, combine tofu, packet stevia, vinegar, and Apple pie spice. Blend until very smooth. 3. 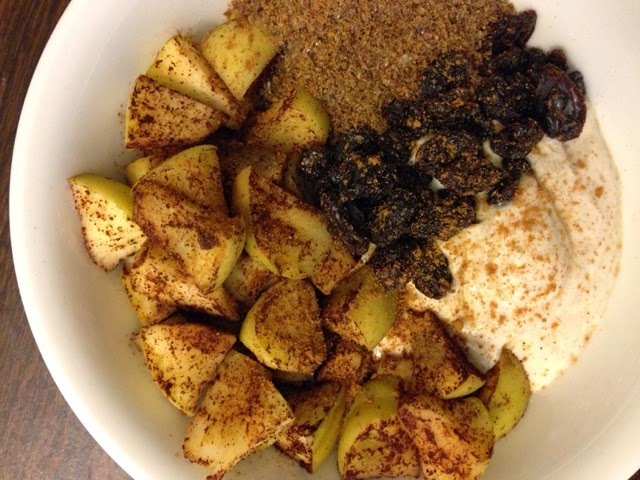 Add warm apples and Nogurt to a medium size bowl, along with flax and raisins. Top with Apple pie spice and enjoy! Two-minute Banana Bread. Grain free! Busy mornings mean quick breakfasts...but quick doesn't have to mean gross guys! (Or unhealthy, but that's a given I think...👌). This "Two-minute Banana Bread" is the perfect breakfast: chock full of healthy fiber to keep you full, carbs for sustained energy, and vitamins and minerals for wellness. When combined with a protein-rich smoothie (add protein powder to any of my smoothie recipes! All are in my recipe file! 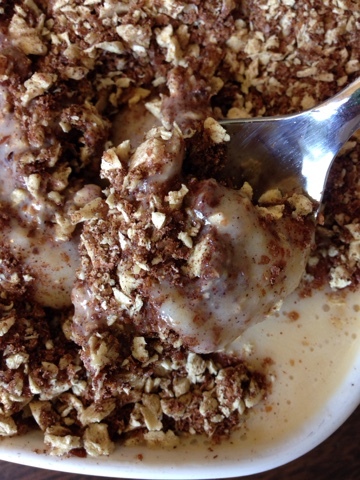 ), this quick and easy microwave recipe turns into a perfect breakfast. Enjoy! Insane. SOOOO GOOD AND SO EASY!! Two-minute Banana Bread. Vegan, Gluten-free. Serves one. 1. Pretty much the same procedure as a regular mug cake...in a medium size bowl, mash your naner and mix with remaining ingredients. 2. 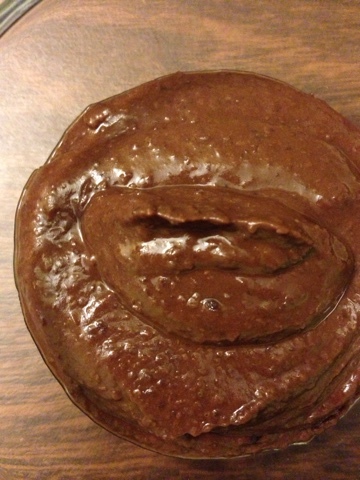 Spread batter into a smallish microwave safe pie dish. Nuke two minutes. Done! Holiday post! 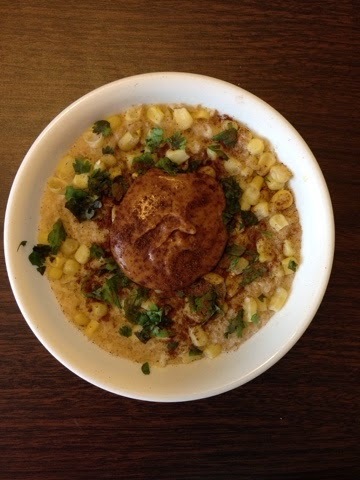 (Well, sort of...): PB Corn Oatmeal...aka cinco de mayo oats! PB Corn Oatmeal. Vegan, gluten-free. Serves one. 1. Place your dry oats in a medium size loco safe bowl and stir in stevia. Set aside. 2. Place corn in a separate small bowl and nuke 50 seconds. Add to oats and mix in water. Stir and nuke 2 minutes. 3. 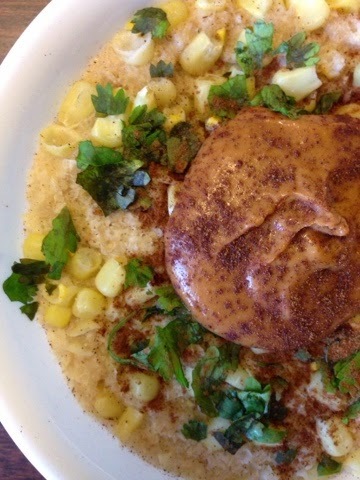 Sprinkle with chopped cilantro, add PB, and top with cinnamon if desired. Enjoy!